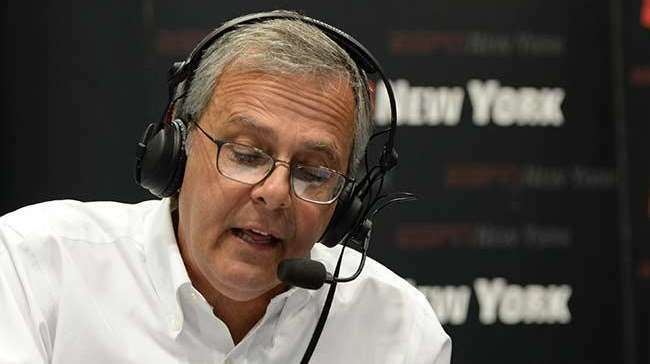 Mike Lupica, whose radio show has been heard on ESPN New York from 1 to 3 p.m., no longer will appear on the channel. ESPN confirmed Lupica's departure Monday morning after an inquiry from Newsday. Lupica had been beaten badly in the ratings by WFAN's Mike Francesa, who roughly tripled his average audience share in recent ratings periods. "We appreciate his contributions to the station but have decided to move in a different direction," ESPN said in a statement. "He will remain a signature voice on ESPN's 'Sports Reporters', where he has been a major contributor to the show's success for more than 20 years." ESPN has not announced a replacement for Lupica, but the leading candidates likely are Alan Hahn and former Islanders goalie Rick DiPietro, a team that primarily has been heard on the station at night, and Ryan Ruocco and Dave Rothenberg, who have been heard from noon to 1 p.m. on the station. The new local midday show is expected to be on from noon to 3 p.m.
Dan Le Batard is expected to replace Colin Cowherd's national show, which had been heard in New York from 10 a.m. to noon. Cowherd recently left ESPN for Fox.